I talked with several of our readers over the weekend regarding the Ethical Fashion article we published a few months back. They spoke about wanting to commit to more ethically conscious shopping habits but didn’t know where to start. So I’ve decided to compile a few easy tips to remember the next time you purchase new frocks (or shoes/handbags/ties/socks/you get the picture). 1) Check where the item is made. Chances are, you’re at least marginally familiar with your home country’s labor laws and practices. So if you live in a country that has a history of positive labor and manufacturing conditions, buy domestic products. Granted, buying products made in these countries isn’t a foolproof way to guarantee that your items weren’t made under sweatshop conditions. (Yes, there are sweatshops even in the good ole’ US of A that operate under shady, illegal terms—but that’s another story for another day.) 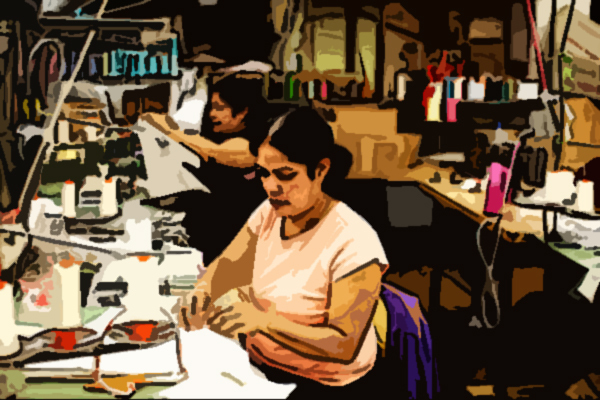 Because of labor and manufacturing laws in these countries, however, you’re much more likely to purchase items that were made under safe and well-regulated working conditions. 2) If the price is too good to be true, it probably is. If you consider the cost of raw materials, labor, packaging, shipping, advertising, and retail markup (among many other things) when shopping for clothing, a five-dollar shirt sounds kind of sketchy, unless you’re at a thrift store. When buying brand-new items, consider prices carefully. Does the item cost just as little as a footlong sandwich? Somebody got screwed along the way—most likely the workers on the bottom rung of the production ladder. Likewise, if a giant retail clothing brand manufactures in countries that are dominated by sweatshops but prices its items like handcrafted, designer goods, you’re probably paying the company too much and the manufacturers too little. 3) Avoid outlets. Once again, if the price is too good to be true, it probably is. Analysts estimate that up to 85% of outlet store merchandise is manufactured exclusively for these stores—meaning they were never meant for the “regular” stores or boutiques in the first place. Read more about “The Myth of the ‘Maxxinista’” here. 4) Do a quick Google search. Before you hit the “add to cart” button (or the cash register), pay a short visit to the company’s website or Facebook page. If they are committed to ethical manufacturing practices, they typically will showcase this fact on their online and social media outlets. Check back tomorrow for a list of our favorite ethically conscious labels!